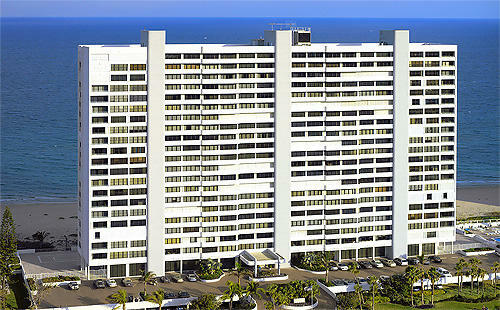 Stratford Arms is an oceanfront condominium building consisting of 22 floors with 120 residences. Units have three to four bedrooms and range from about 2,100 square feet to 4,235 square feet of living space for double units. Residences have semi private elevators, oversized terraces and wrap around balconies with unobstructed direct views of the Atlantic ocean. Units have double door entry foyers, floor to ceiling glass windows and sliders and washers and dryers within the condo. Many units have been luxuriously updated to include appointments such as granite countertops, stainless steel appliances and electronic window treatments. Stratford Arms was built in 1975 but is undergoing extensive renovations such as new impact windows installed throughout the entire building and remodeling all elevators. Amenities include concierge, large beach area, heated pool with swimming lane, tennis, fitness center, sauna, shuffleboard, game room with pool tables, social room with kitchen, library, picnic facilities with BBQ area, extra storage and underground garage parking. 24 hour security includes doorman, cameras and an onsite management staff. 3 BEDS | 2.1 BATHS | 2101 SQFT.